Welcome back lovelies to our next monthly Rerun! Each Rerun will provide plenty of inspiration focusing upon a featured product, a month-long sale on the featured product and a challenge (with a prize!) and *all-new* giveaway. You will not want to miss out! For our eighteenth Rerun we are concentrating on The Big, the Bold and Extras. 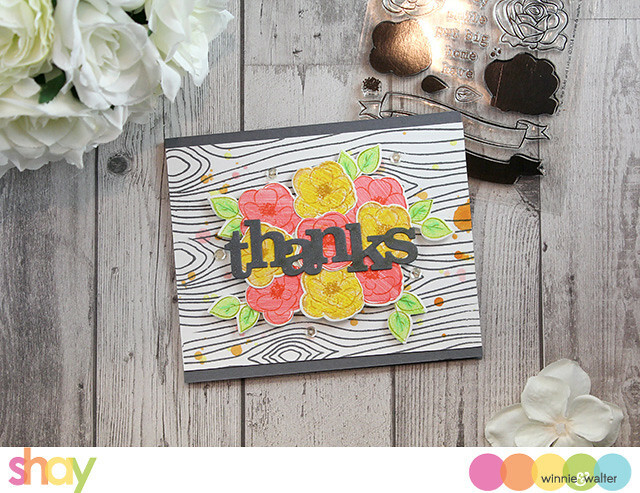 This set has bold and outline roses, leaves and banner along with some little words which work well with any of the The Big the Bold series. Now on to the cards! 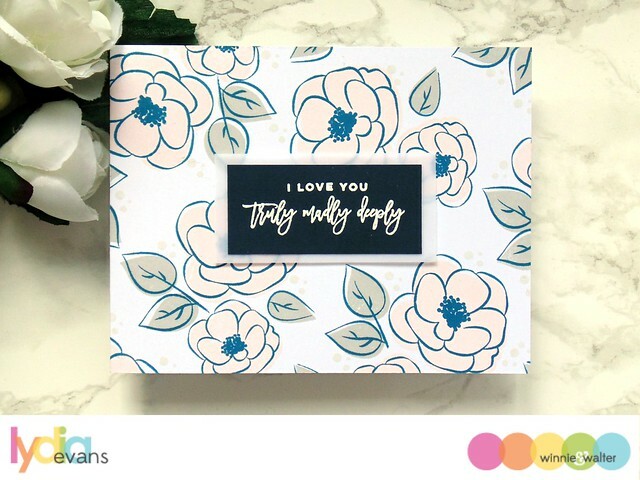 Roses are timeless and so are the roses found in The Big, the Bold and Extras and I wanted to match them up with a newer stamp set like Scenery: Into the Woods because can you ever have enough wood grain? I personally don't think so. I began by stamping the outline wood grain pattern in charcoal grey on a piece of white cardstock. I wanted to pair the grey with bright. happy colors (abandoned coral, ripe persimmon, scattered straw, fossilized amber, crushed olive and twisted citron Distress Ink). 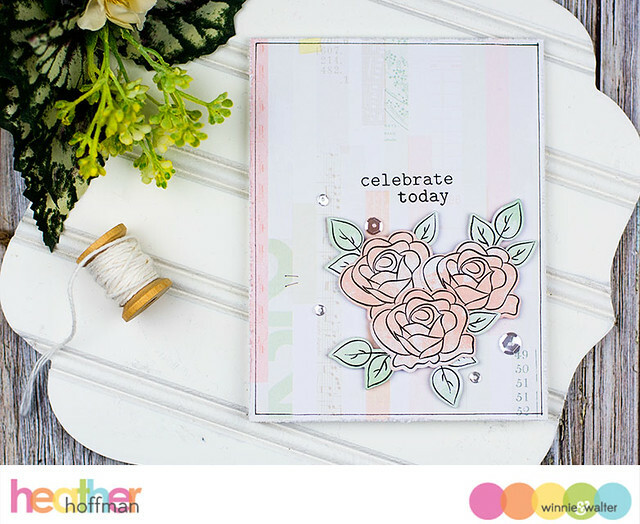 I stamped the solid roses in a lighter color (I swiped the color on after using Versmark) and then over-stamped with the outline stamp in a darker color along with the center several times. I also stamped the solid leaf duet and over-stamped with the outline several times. I cut out images using The Big, the Bold and Extras Cutaways. I colored in the yellow roses and leaves with colored pencils. I attached the roses and leaves to a piece of card stock to create a cluster. Over the cluster I added In a Word: Thanks Cutaway cut from charcoal card stock. I added some drops of ink on the wood grain panel. I attached the cluster to the wood grain panel with dimensional foam adhesive and the whole panel to a charcoal grey card base. Finally I added some sequins. 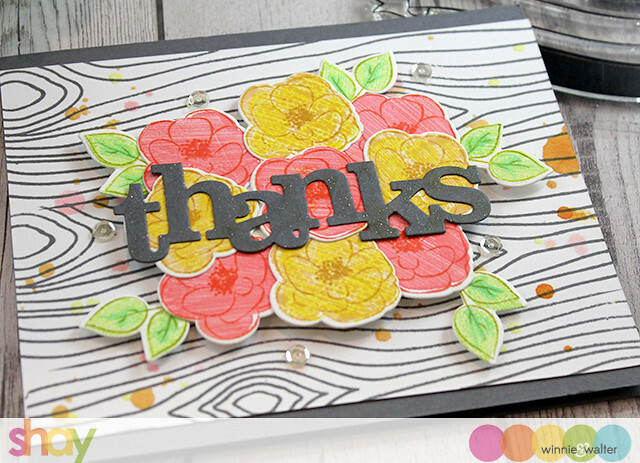 That's it from me...wait until you see what Heather H., Lydia and Vanessa did with The Big, the Bold and Extras! Now it's your turn to play along with Rerun! Create a new project using The Big, the Bold and Extras (and/or The Big, the Bold and Extras Cutaways and/or the coordinating cut files). An alternative to using The Big, the Bold and Extras. (and/or the coordinating cut files) is to create a new project using one of the projects featured in this post (or any Rerun post throughout April by The Talent) as your inspiration. Make sure you use at least one (1) w&w product (this can include a freebie found in the w&w shop) in your project. If you choose the alternative to using The Big, the Bold and Extras. (and/or the coordinating cut files), please include in your post or project description which project inspired you and how. Link up your project here by 11:55 p.m. CST on April 30, 2017. Enter as many times as you want before the deadline. This Rerun Challenge may be combined with other challenges found here on the w&w blog or elsewhere. One project will be randomly chosen to win $25.00 credit to the w&w shop! The winner will be announced on in it's very own post on the w&w blog later in May. Please comment on this post (make sure to include your email address in your comment--if you have to add your email address to your comment please do so by replying to your original comment) by 11:59 p.m. CST on April 30, 2017 for a chance to win your very own The Big, the Bold and Extras stamp set! Wow!! Beautiful stamp set, love the flower images in it. Gorgeous cards :) thanks for the inspiration !! Loads of beautiful inspiration. Gorgeous cards. Oh my!!! Lots of stunning cards!!! Love these gorgeous flowers!!! Each of these cards is so pretty!!! I love the florals. 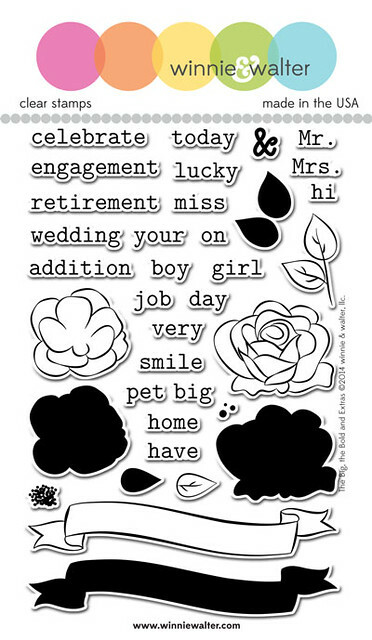 This is a fabulous stamp set with all the wonderful sentiments and the flowers. Thank you for this fun challenge and the chance to win!!! Gorgeous cards! I love all the different looks with the cards featuring this pretty stamp set! Awesome coloring ideas! Lovely cards! I don't have this stamp set and I wish I did..Thanks for the chance! Such delightful cards. I look forward to playing along. I think I want to CASE all four cards. Wonderful projects with this set. My fave is the first one with the wood grain background. Oooh, your card is so pretty and, to answer your question, I don't think anyone can have too much woodgrain! 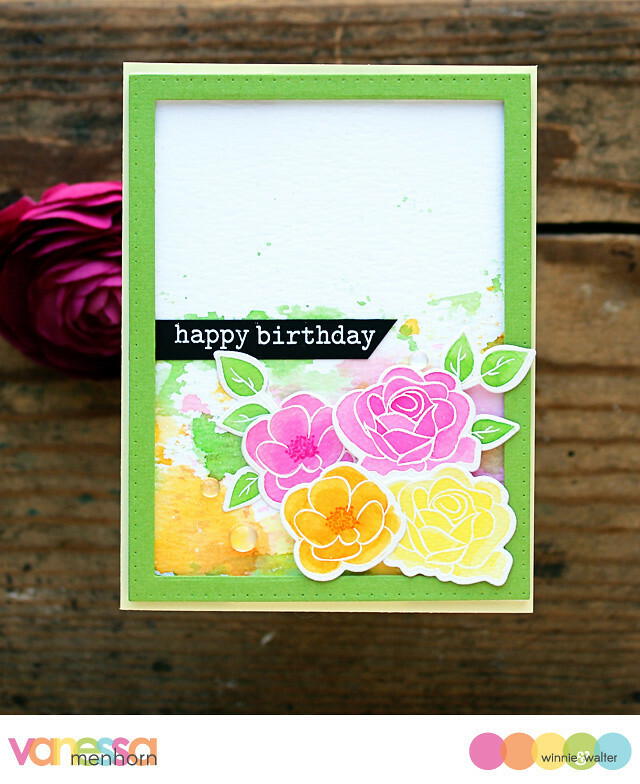 Love the delicate roses against the wood grain background and am excited to give this a try myself. Beautiful and very inspiring! Thanks for sharing! Wow..beautiful cards from the team..so inspiring.. Thank you for sharing. What a beautiful set this is. And all the DT cards are so pretty.